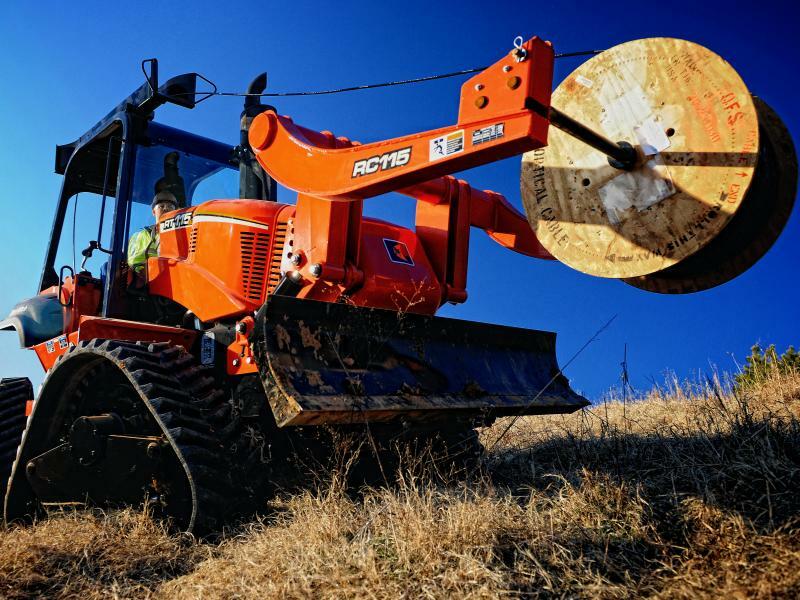 One look at the foundation of the RT115 Quad trencher begins to explain how it can be so productive in extreme conditions. 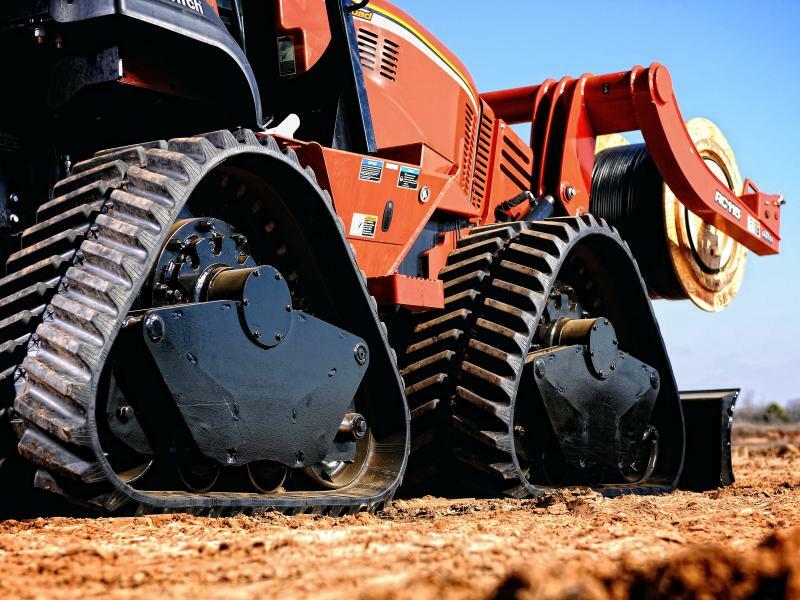 Its unique chevron track pattern is designed to reduce mud buildup and give the RT115 Quad outstanding traction on muddy, uneven terrain. 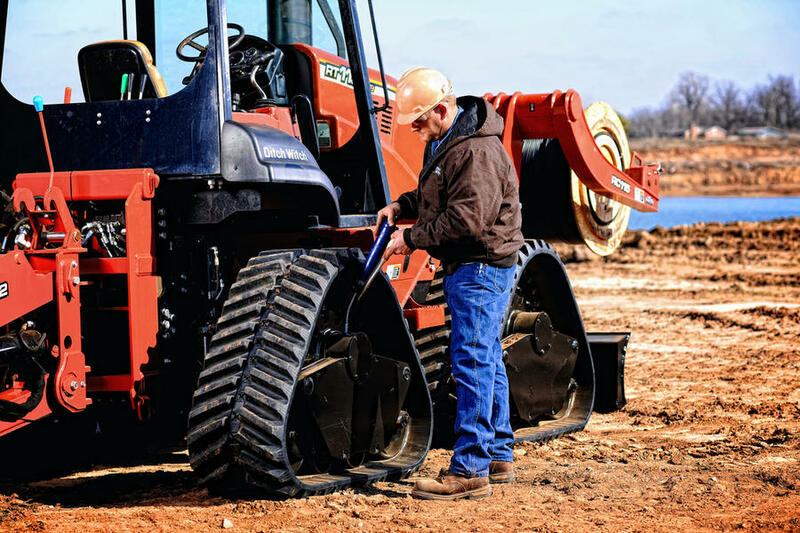 Move up 15.5 inches —or the height of its best-in-class ground clearance—to the base of its incredibly heavy-duty undercarriage, reinforced for maximum durability when you need it. Industry-exclusive chevron track pattern provides maximum traction in wet conditions and on slopes. 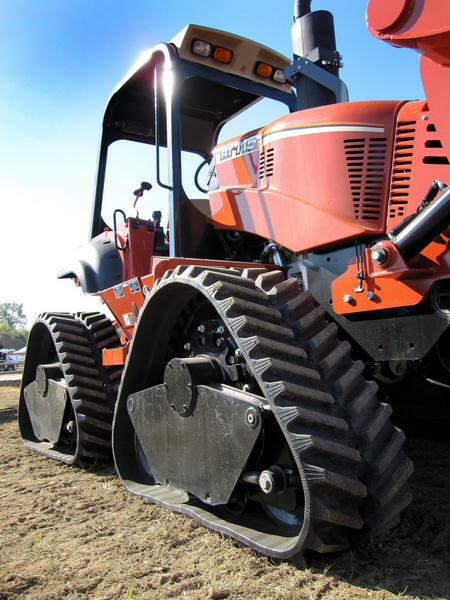 Specially manufactured, heavy-duty track frames weigh 1500 lb each, including track, providing a lower center of gravity for increased stability and drawbar. 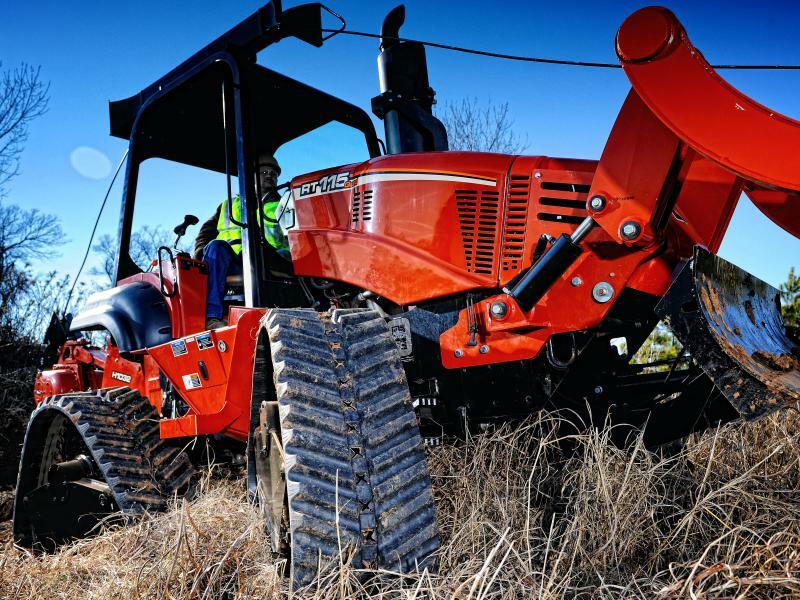 The RT115 Quad’s three-speed, shift-on-the-fly ground drive delivers outstanding performance in virtually any soil condition. 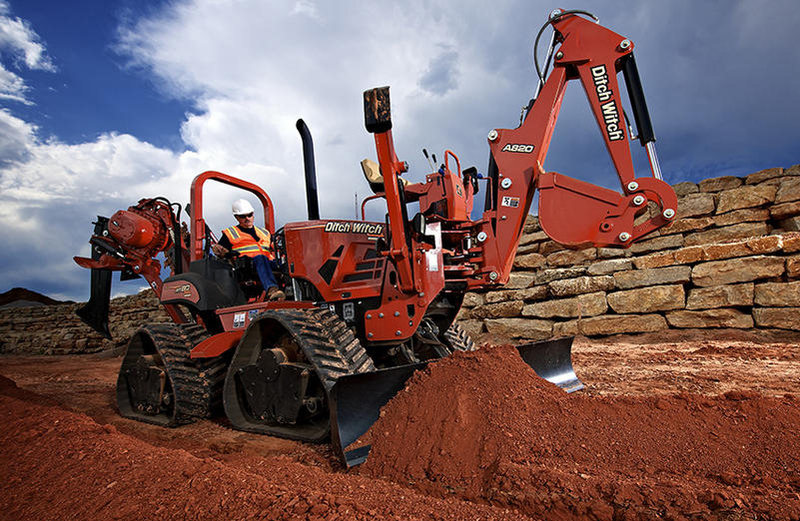 Heavy-duty undercarriage is built for durability and long life. 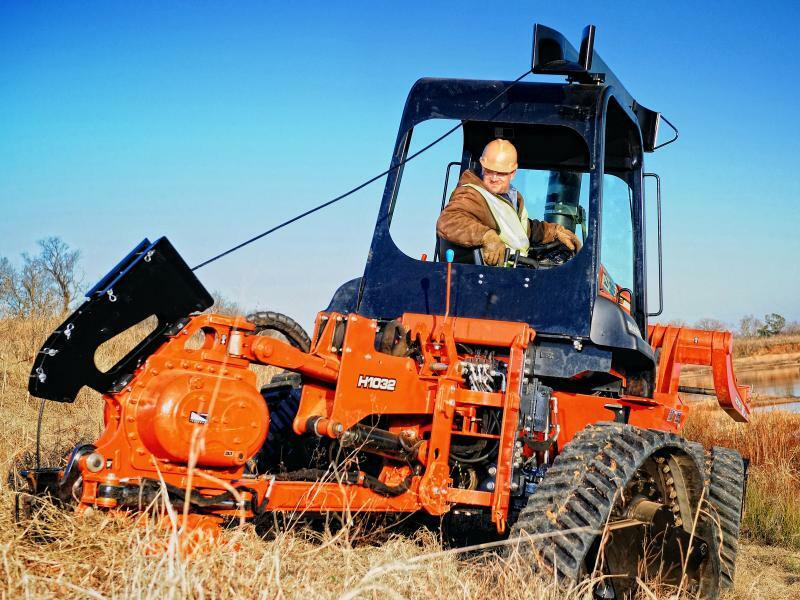 115-horsepower John Deere engine and reliable hydrostatic transmission keep the RT115 Quad running strong all day long. 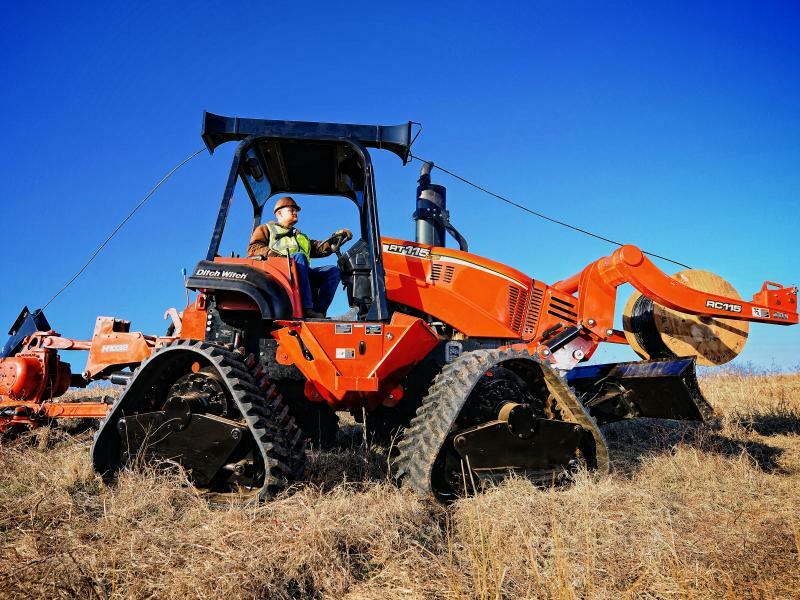 Large selection of hydrostatic attachments—plus a choice of two front-mount utility backhoes and a reel carrier—accelerate your productivity. 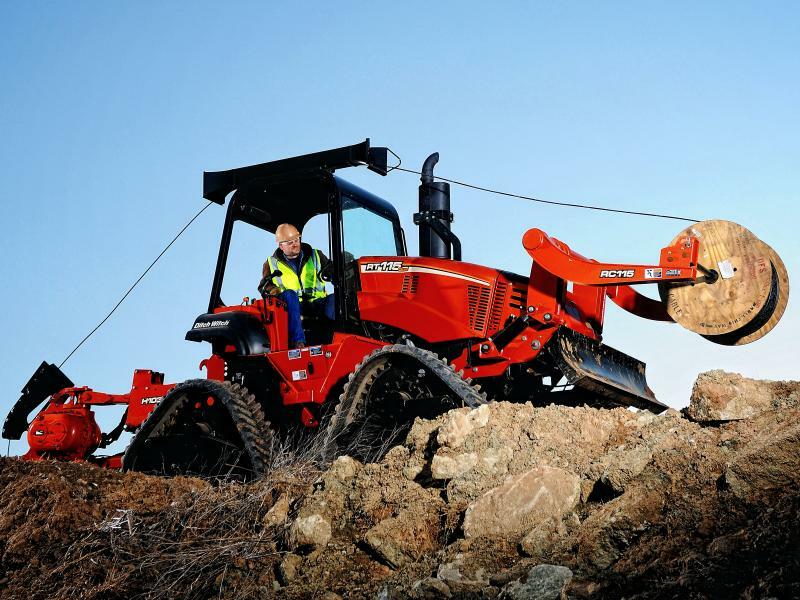 Plow attachment features heavy-duty lift arms that withstand the RT115 Quad’s tremendous power and drawbar. 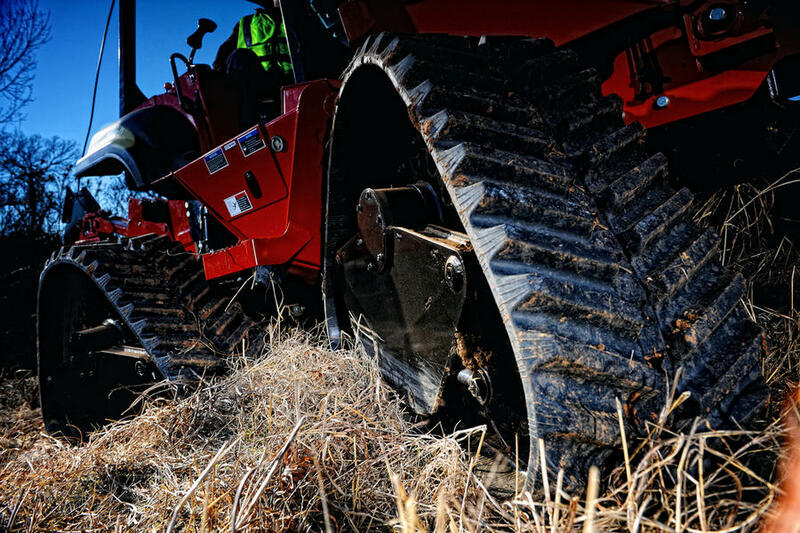 Best-in-class ground clearance of 15.5 inches helps the RT115 Quad be more productive in and around bar ditches, creek beds and uneven terrain in general. 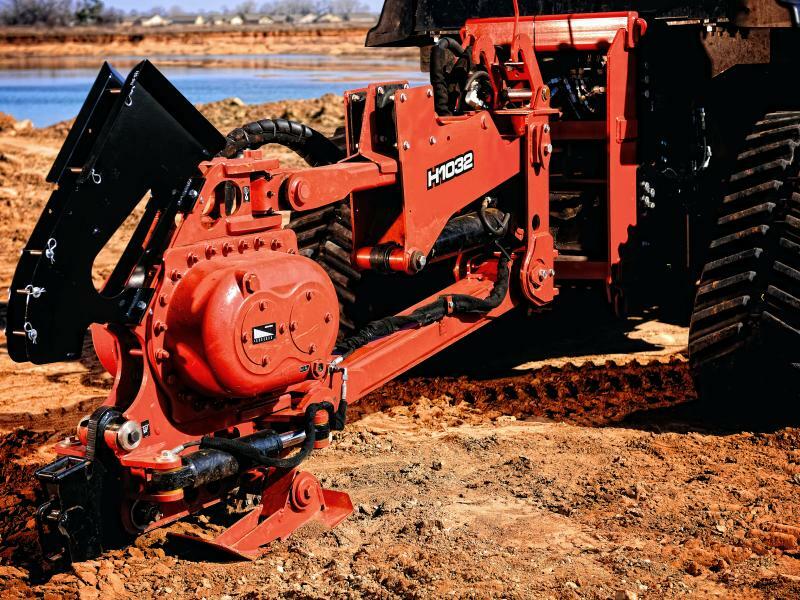 Standard tilt frame configuration helps you dig a vertical trench on uneven ground. 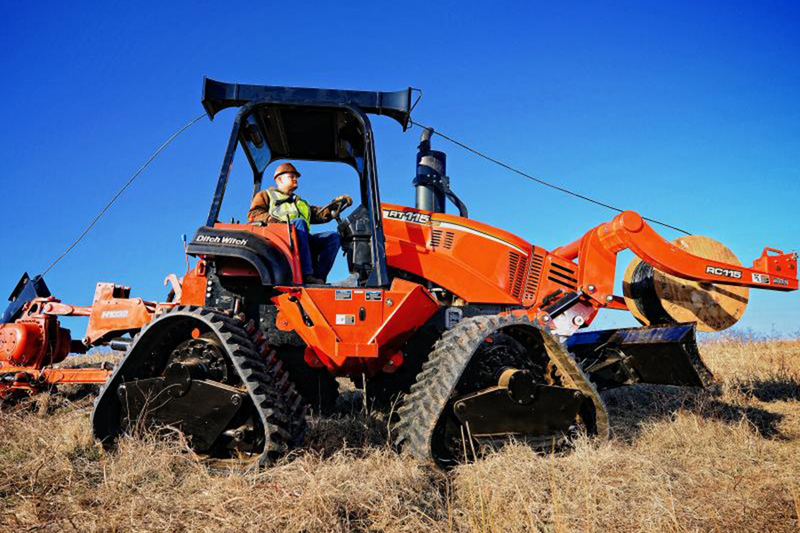 Standard rear steer gives the RT115 Quad a tighter turn radius, resulting in better jobsite maneuverability and increased versatility while digging. Equipped with an electrically controlled pump that requires minimal maintenance (no cables to adjust) and provides better response and controllability. 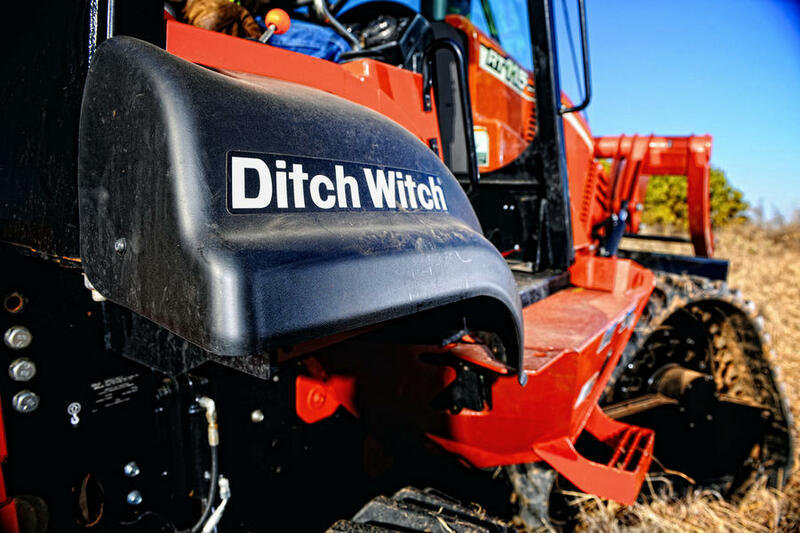 Improved cruise-control system, which can be optimized for plowing, is standard equipment. Ergonomically designed operator station features a 90° swivel seat, adjustable armrests, easy-to-read gauges, and a tiltable steering column.